Amid the global outcry over hellish migrant camps in Libya, many African leaders have accused the country of racism and crimes against their African “brothers”. But for those who have returned from the living hell, it’s not only the Libyans who are profiting from the “migrant business”. Illegal migrants are also the prey of sub-Saharan mafia groups, especially Nigerians. Daniel* was a student when smugglers convinced him to travel to Europe, which many migrants see as the path to a prosperous life. “In two weeks, you will be in Italy,” they promised him. But 10 months later, in early December, the 28-year-old Nigerian was repatriated to Benin City, his hometown, after enduring kidnapping, violence and forced labour. His legs were lacerated by electric wire burns. “We feel cheated. It was a trap. The guys who did that to us are the ones who collected money from us” to go to Europe, Daniel said, surrounded by his likewise disillusioned companions. Some 200 Nigerians being repatriated that day could hardly begin to describe the horrors they had suffered in Libya. But others spoke up as confidence and a spirit of revenge began to show, and their testimonies recounted to AFP were unanimous: both Libyans and Nigerians are responsible for the ill treatment, kidnappings and enslavement of migrants. Daniel paid 550,000 nairas (1,290 euros, $1,530) to a criminal organisation for his promised passage to Europe. “When I arrived in Libya the contact I had there told me that the money was finished and that I should pay 500,000 extra,” he told AFP. Daniel could pay and continued his journey. Arriving at the coast, the network of smugglers demanded he pay 400,000 nairas (937 euros) to cross the Mediterranean. Once more he paid up and was freed — but he never got out of Libya. Stuck in Tripoli, Daniel did small jobs for the equivalent of about two euros per day. “I was going to work, hidden in the boot of the car. You don’t want to be seen if you are illegal because Nigerians or Libyans can kidnap you,” he said. Daniel finally gave himself up to the authorities, in the hope of being deported to his home country. His bank account empty, he waited seven months in a detention centre where Libyans came to get them to work for free “like slaves” during the day. Nigerian consular services based in Libya have sped up the repatriation procedure under orders from Abuja, after a CNN video showing migrants being sold as “slaves” shocked the world. In November, 1,300 Nigerians were repatriated compared with only 643 between last December and March. Nigerian authorities claim that 5,000 nationals are still “stranded” in areas “accessible by consular services”. 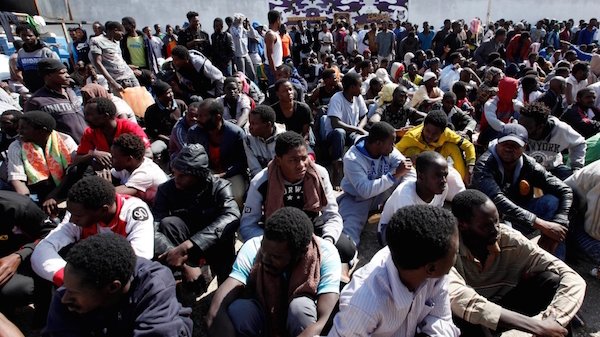 According to the International Organization for Migration (IOM), nearly 250,000 sub-Saharan migrants were in Libya, as of the end of September. The largest number of them are from Nigeria, a country of 190 million people. The IOM noted that these estimates were “certainly lower than the reality”. Osagie, another Nigerian repatriated to Benin City, also denounced the corruption of certain employees at the Nigerian embassy in Tripoli and the IOM “who asked for bail” to get them out of official detention camps. “They are supposed to help us to return home, but they are looking to enrich themselves,” said the young man. The relevant authorities declined to respond to questions by AFP. At the same time, international organisations find access to Libya extremely complicated and limited. “Yes, both Nigerians and Libyans are involved in (human) trafficking in Libya,” said Julie Donli, director de NAPTIP, a Nigerian security unit against trafficking. But she added that it was difficult to get information from the victims. Now back in Nigeria, Osagie says he will not file a complaint against his smugglers. The law of the jungle reigns. “We don’t trust the system. At the end of the day, you lose when you report a situation like that and after one month the person is out (of jail), they will come get you,” he said.